Considering getting a German Shorthaired Pointer? Gentle and easy-going, but originally bred as a hunting dog, the German Shorthaired Pointer (GSP) is an energetic dog breed ideal for an equally active owner. 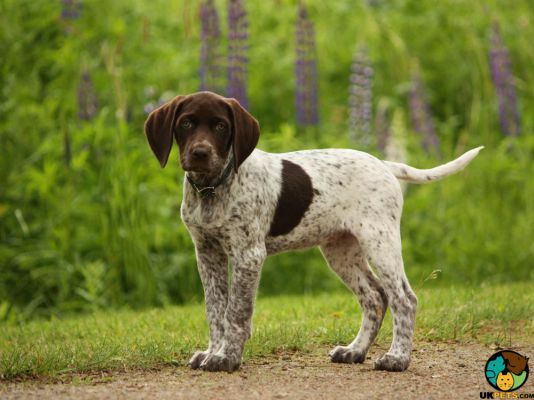 Its lineage comes from crossing the Spanish Pointer with the German Bird Dog, and later on, the English Pointer. The GSP has an aristocratic bearing, standing 50 to 60 centimetres at the withers and weighing 45 to 70 pounds. It is an affectionate dog breed that loves to be with people and enjoys the outdoors with its family. 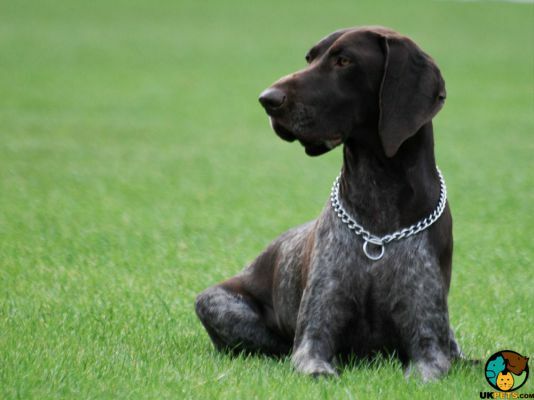 Are you thinking of owning a German Shorthaired Pointer? Here is a brief background to this loving family companion dog breed. 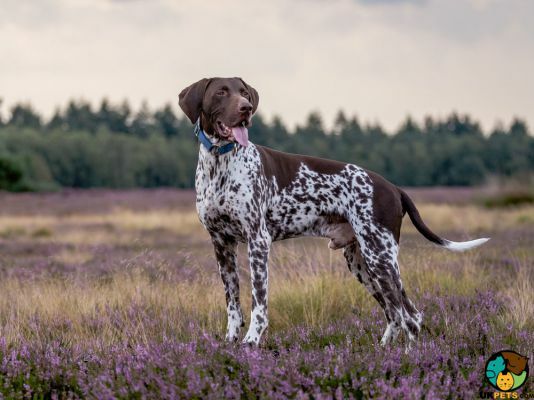 While not proven, it is believed that the German Shorthaired Pointer descended from the Spanish Pointer, German Bird Dog and a local German scenthound. It was originally bred to be a multi-purpose hunting dog in the mid to late 19th century. 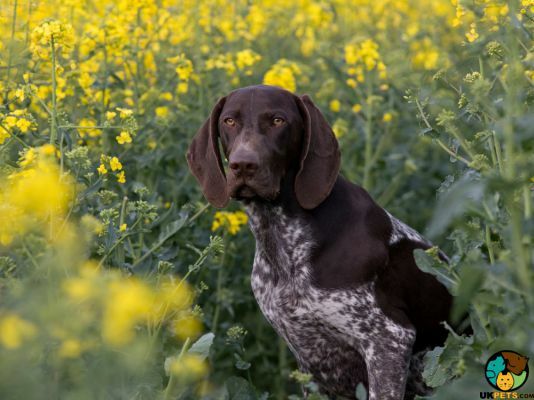 In the late 1880s, records show that German breeders continually refined the GSP to develop a breed that is elegant, with improved stance, keen intelligence and effective scenting skills. Through the process of selective breeding, the English Pointer was later added to the mix, along with the Foxhound. However, the breeding program was disrupted when World War II broke out. As a result, most breeders hid their German Shorthaired Pointers while some of the best GSPs were sent to Yugoslavia for safekeeping. After the war, access to Yugoslavia became impossible, which means German breeders had to start redeveloping the earliest version of the breed to what it is today. In 1930, the GSP was officially recognised by the American Kennel Club and later by the United Kennel Club in 1948. The German Shorthaired Pointer is said to have contributed to the development of the German Wirehaired Pointer. One of the most adaptable sporting breeds, the German Shorthaired Pointer is a stylish and regal hunting dog that is also a superb family companion. It is slightly smaller than most pointer breeds, standing 53 to 64 centimetres at the withers and weighing 45 to 70 pounds. This dog breed is described as having a square body being slightly longer than it is tall. The GSP has a chiselled head and dark almond-shaped eyes that expresses intelligence and humour. It has a large brown nose with wide nostrils, broad ears that drop and lie flat against the head. It has a graceful outline, sturdy quarters and athletic physique that allows for smooth movement, light and ground-covering. The GSP's skin is tight, sporting a short water-resistant coat that is thick and rough to the touch. Its coat is slightly longer on the underside of its tail and the back of the edges of the hip or haunches, while shorter and thinned on the head and ears. The German Shorthaired Pointer wears coat colours such as solid liver, liver and white, liver patches, white ticked or liver roan. Other colours are not acceptable by breed standards. When it comes to grooming needs, the German Shorthaired Pointer is low maintenance. It's a moderate shedder and only needs weekly brushing using a firm bristle to keep dead hair under control. Bathing must be done only as needed. Frequent bathing can remove its natural, water-repellent oils, which can cause for its hair to break down. Rub your GSP with chamois to keep its coat's healthy gleam. Check ears regularly for signs of infection and irritation. Brushing the dog's teeth weekly will keep away bad breath and prevent the build-up of tartar. Also trim its nails, especially when they start making a clicking sound on the hard floors. Bred as a multipurpose hunting dog, the German Shorthaired Pointer is a loving and devoted family companion. This breed is smart, friendly and sometimes overly enthusiastic about everything it does. GSPs love being around people and will like nothing more than being outdoors with friends and its family engaging in some activity such as a long walk, hike, jog or a game of Frisbee. It is best suited for a family who is equally active. When GSPs lack exercise, they can become high-strung, agitated and can develop bad behaviours. It also doesn't like to be left alone and can develop separation anxiety. This dog breed is excellent with children, preferably with older ones, since toddlers may easily get knocked over, which means interaction should always be supervised. The German Shorthaired Pointer is an excellent watchdog and will not hesitate to alert by barking when someone is approaching the house. The breed gets on well with other dogs, but with its strong hunting instinct, it is not always good around small pets such as cats or rabbits. When it comes to training, the GSP is a people-pleaser so providing instruction and guidance will be easy. 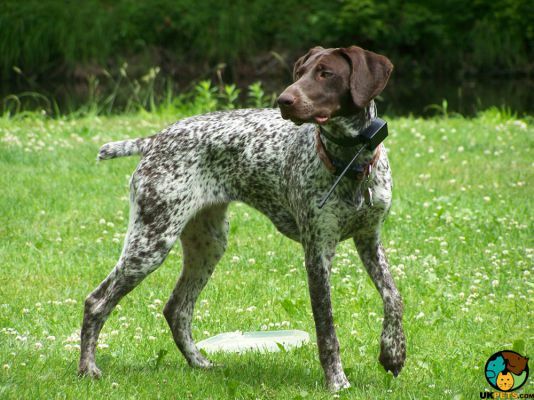 Although it does not respond well to harsh discipline, the German Shorthaired Pointer will need an owner who can display an air of authority, able to provide a firm, calm, and consistent training. Early socialisation will help ensure that the GSP will grow to be a more flexible and adaptable dog. A typical serving for an adult German Shorthaired Pointer is 2.5 to 3 cups of premium dry dog food daily, split into two meals. The ideal nutritional requirement including the frequency of feeding will depend on the breed's age, weight, metabolism, activity level, and health. If in doubt about what and how much to feed a GSP, make sure to consult with a veterinarian. Below is a guide to a typical calorie need of an adult German Shorthaired Pointer that weighs 55 pounds. German Shorthaired Pointers are medium-large dogs, which means they should be fed good quality dog foods and specially made for medium/large dogs. The German Shorthaired Pointer is generally considered a tough and sturdy dog. The average lifespan for this breed is estimated to be between 12 and 15 years. However, like all dogs, some hereditary health issues exist. These health issues include Hip Dysplasia, Lymphedema, Entropion, Von Willebrand's Disease, Bloat/Torsion, and even some forms of cancer. When it comes to exercise, it is of paramount importance that GSPs be given an adequate amount of it since they are tireless and energetic dogs. Take your dog for a brisk, long walk daily or have it accompany you on a jog or run. German Shorthaired Pointers become restless and destructive when under-exercised. It is also important to make sure that they are well within a securely fenced backyard that is not lower than 6 feet tall. GSPs tend to escape by jumping over fences. Once you find a German Shorthaired Pointer breeder that you are happy with, you might have to wait for them to have a litter with a puppy available. To buy a German Shorthaired puppy will cost about £650 to £850 for a purebred. However, the price to buy your GSP will not be the major financial consideration when you bring home your new puppy. Make sure that you can set aside a budget for monthly food costs (£40), pet insurance (£20 to £50 a year), veterinary consultations (£800 to £1,000 a year) and any one-off costs including beds, toys and training equipment (£200). The German Shorthaired Pointer is a loving, devoted and intelligent family dog. GSPs have tireless energy suitable for outdoorsy families. >It suffers from separation anxiety when left alone for extended periods. >It is low maintenance since it has a short, glossy and water-resistant coat. This dog breed is great with children, preferably with older ones. Only a few litters of GSP puppies are available a year.